InkTip, award-winning website and magazine that matches screenwriters with movie industry decision-makers, has named ScreenwritingU, its #1 choice for screenwriting classes. ScreenwritingU offers professional online screenwriting classes containing information from in-depth interviews with the top 1 percent of Hollywood professionals. 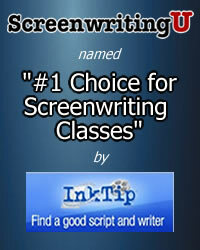 ScreenwritingU, an award-winning, Los Angeles-based company that provides the highest quality online screenwriting classes, is pleased to announce its official designation as InkTip’s #1 Choice for Screenwriting Classes. Named one of the best websites for moviemakers by MovieMaker Magazine, InkTip presents screenwriters’ loglines and synopses to 30,000 producers, online and in its print magazine. ScreenwritingU’s classes combine the convenience of professionally designed online learning and teleconferences with a virtual community of dedicated writers. Information on ScreenwritingU’s scope and variety of avenues for breaking into Hollywood is at http://www.screenwritingu.com. Jerrol LeBaron, founder and CEO of InkTip, says, "InkTip is proud to endorse ScreenwritingU as our number one choice for screenwriting classes and recommend their top-rated resources and services to our clients." Croasmun has distinguished ScreenwritingU as a leader in providing award-winning online screenwriting classes and career-building opportunities that screenwriters can find nowhere else. During the last ten years, he has interviewed over 500 Hollywood producers, managers, agents, and A-list screenwriters to design an "Expert Model" of how a screenwriter can write a screenplay and succeed in this tough industry. ScreenwritingU is a Los Angeles-based company with clients worldwide who are building careers as screenwriters. The company provides high quality screenwriting classes, teleconferences, newsletters, and articles; special events for meeting Hollywood producers, agents, and managers; screenwriting contests and opportunities for landing jobs; and access to exclusive offers from top script marketing sites, critique services, and coaches. With ScreenwritingU’s newsletter subscribers, clients, and social networking sites, the company keeps in regular contact with 100,000 screenwriters. ScreenwritingU’s vision is to offer the most organized and effective track from first draft to entry into the movie industry, including its award-winning classes, and alliances with highly regarded screenwriting teachers, software experts, and access to the industry. ScreenwritingU’s founder and president, Hal Croasmun, has been a featured speaker at multiple conferences, including major industry gatherings such as Screenwriting Expo, InkTip Summit, Austin Film Festival, among others.